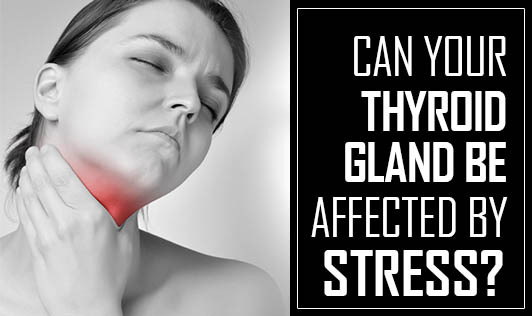 Can your thyroid gland be affected by stress? Stress is an inevitable part of life. Rushing in the traffic, meeting important deadlines, fulfilling social commitments, satisfying role expectations to even taking care of your self can push your stress levels out of control. Can it be a bad news for the thyroid gland? What is this stress – thyroid connection? When we are stressed, our body releases the hormone cortisol. Excess of cortisol can interfere with thyroid hormone production. So, stress definitely plays a role, but there is no clear proof of stress being a sole cause of thyroid problems. It may escalate an underlying thyroid condition, for example: if hypothyroidism runs in the family, then the cortisol hormone released under stress may further suppress the thyroid hormone. Stress and thyroid imbalance can feed on each other. Stress can aggravate the imbalance or you may feel stressed because of the imbalance symptoms. Stress also increases your vulnerability to autoimmune thyroid conditions. How does one go about breaking the stress – thyroid connection? If you have a thyroid imbalance, or have a family history of thyroid dysfunction, it is best to keep your stress levels in control. To manage stress, incorporate the following in your daily routine. Eat three well-balanced and two healthy snacks each day. Caring & nurturing for your own self can manage the waves of stress with more ease.